Greetings all! Things are starting to wrap up here in Santa Fe. The second to last opera of the season, Tea: A Mirror of the Soul, by composer Tan Dun, is in first dress tonight. It will open this Saturday. The last opera, Platee, will begin dress rehearsals next monday and open on Sat., July 28th. The last day of my contract! I have been having a great time , have met a lot of wonderful people that I will keep in touch with, and have honed my tailoring skills and learned new ones. With that said, I am definitely looking forward to getting back to Austin! I miss my friends, That Guy, and my cats! It also means that I only have four weeks until classes start. During that time the only thing I have planned so far is to visit my sister in Wisconsin so I can see my niece and nephew. My nephew is two years old now, and I haven't even met my niece yet, who was born back in February! 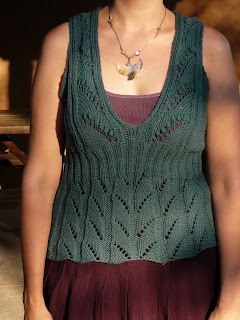 I have managed to finish one top this summer - the Bonsai Tunic from the Spring Interweave Knits. I did a bonehead thing - I read through my pattern one night after hiking all day and overlooked an instruction. Confused and convinced I was unable to move forward, I emailed the magazine. Not only did they respond to me within that same day, they were also kind in pointing out to me that the instructions I was looking for was AT THE VERY TOP OF THE PATTERN. Duh! So, never heisitate to email them with questions - they are prompt AND nice. I did make some modifications. 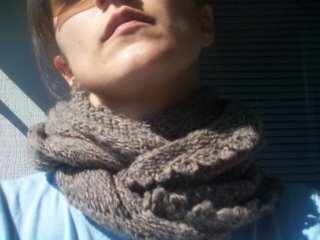 I used 2nd Time Around Cotton instead of the called for yarn, and I knew I didn't have the required yardage. No matter, because the length that is pictured would hit me at the widest point of my hips, so I didn't mind making it a bit shorter. Also, I am a hippy gal, so I still cast on the number of stitches called for and simply did the decreases more frequently than called for. I'm really happy with how it turned out and I have received many compliments on it in the costume shop. I even was asked to do a workshop next week with another opera shop staffer! Opera picture! 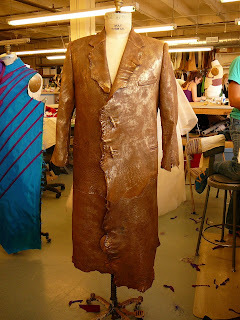 This is the coat that I built for the character of Apollo in the opera Daphne. It's caramel colored leather with a gold sort of glaze finish to it. When we work on projects of this size we are often doing so facing a deadline (fittings and dress rehearsals, not to mention openings night!) so often more than one person works on it at once. So when I say I made it, it does mean that someone else made the pattern and cut it out. Then it gets handed off to a primary stitcher (in this case, me). Other stitchers or even a first hand might jump in to move things along in order to finish on deadline. For this coat, the other stitcher on our team, Brian, put together the lining pieces and the sleeves, and one of the first hands, Rolf, helped with putting in the coat fronts (the inner linings that gives the coat structure). But I get to take credit for the pockets, setting in the sleeves, and the collar, along with the piecing of the coat body. What I'm getting at is that the coat is pretty sweet and I'm proud of my work on it.